3.2 May 5, 2012: Anti-coal protesters arrested in White Rock, B.C. 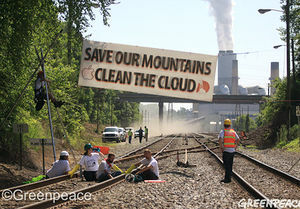 Activists "brand" coal trains bound for Marshall plant with Apple logo. On May 3, activists protested mountaintop removal mining by locking themselves to train tracks, preventing coal train loads from entering Duke Energy's Marshall Steam Station in North Carolina. The activists, affiliated with RAMPS, Katuah Earth First!, Greenpeace and Mountain Keepers said they would not leave until Duke agreed to end its use of mountaintop removal coal operations. The power burned in Marshall is used to power Apple's iCloud data center. 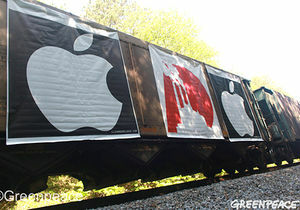 Four activists handcuffed themselves to tracks, while others draped banners with Apple's logo on freight cars. May 5, 2012: Anti-coal protesters arrested in White Rock, B.C. On May 5, 012 thirteen protesters, along with one of Canada's leading energy-environment economists Mark Jaccard, a professor of sustainable energy at Simon Fraser University and a Nobel Peace Prize winner, were arrested after they set up a blockade on train tracks in White Rock, B.C., aimed at halting U.S. coal trains from reaching local ports. ↑ Mountain Justice SummerPrevious Actions, April 2008. ↑ "Anti-coal protesters arrested in White Rock" CBC News, May 5, 2012. This page was last edited on 8 April 2015, at 16:15.